When led by a caring mohel, the bris ceremony should be a beautiful, spiritual experience. There are 2 parts to the bris ceremony; the circumcision, and the giving of the Hebrew name. 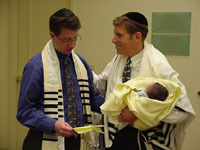 The bris begins with the baby being brought into the room ceremoniously, carried by a grandmother or other honored guest, while all in attendance say, “Baruch Haba”, the greeting reserved for royalty. He is held by other family, honored guests, or godparents, before being held in the Chair of Elijah the Prophet, whose spirit is said to be present at all brises. The child is then lovingly held by the sandek, usually a grandfather if he is able, while the mohel and father bless him and the mohel performs the circumcision. In the hands of a competent, experienced mohel, the circumcision takes less than a minute, which is actually much quicker and less painful than most hospital circumcisions. Although pain relievers (other than sweet kosher grape wine) are traditionally not used, Dr. Katz does offer a local anesthetic cream that can be applied one hour before the bris to numb your baby's skin. Following the circumcision, he is held by his mother while a bracha is said over wine, which sanctifies the ceremony. He is then given his Hebrew name. The service concludes with a blessing of quick healing for the baby and his mother, a rousing chorus of Simen Tov und Mazel Tov is sung, motzi is said, and a festive meal or snack is served. The formal festivities take about 20 to 30 minutes, and may be performed either at your home or synagogue. You may individualize the ceremony as you wish, using or modifying an English reading provided by Dr. Katz, or using your family’s own words about their hopes and prayers for your baby or the origin of his name. Dr. Katz provides a beautiful certificate commemorating the event, and a gift in honor of your son’s bris.